A few years ago, you could mention crime scene forensics, and people would look at you as though you offered them hearts of palm. Sure, they knew that there were people out there that did the dirty work of picking up evidence, but they hadn’t a clue what methods were used, or how important those that perform this job can be to the successful conclusion of a criminal case. With the runaway success of CSI: Crime Scene Investigation on television, and the spin off CSIs supposedly taking place all over the country, the common man can now determine many aspects of how a crime scene needs to be approached, such as what forensics tool would be necessary to locate evidence. I can imagine a bona fide crime scene investigator hard at work on a scene, and having an eighty year old lady with two French clipped poodles casually look over his shoulder and say “You might try the luminol and the electrostatic dust print lifter – it works well for me.” No doubt the police officer would be grateful for the unexpected assistance. Then there was the advent of the computer game CSI, which has been followed by CSI: Dark Motives and CSI: Miami. Here we’re mainly going to take a look at CSI: Dark Motives, the second in the series. Does it have an authentic feel about it, and is it enjoyable? More on that later. You the player enter the game as a recent graduate of crime scene investigation school. You are directed to a fresh crime scene by your new boss Gil Grissom, and you’ll be working with Catherine Willows on your first foray into the world of criminal forensics. The first case concerns a dare devil motorcycle stunt “gone bad” – did someone tamper with the motorcycle, or was it just an unlucky accident? A successful completion of this case will be followed by four other cases, each accompanied by one of the investigators from the TV show: the strong but soft spoken Nick Stokes, the humorous and easy going Warrick Brown, the sassy Sara Sidle, and culminating with the hunky Gil Grissom. Accompanied, but the investigation is up to you to solve. You choose the appropriate tools of the trade, and decide where the suspect focus is going to be. You decide in which order to go to locations, and when to approach Captain Brass to attempt to obtain a warrant, with side trips to the medical examiner and the lab. Along the way if you find yourself stuck, you can ask the other investigator for assistance, but this will count against your total score. Finishing each episode with high points will allow you to see extra material, such as art work. Theoretically anyway, it would seem that even if you ask several times for help, you will still score high enough to see the extras – and you can safely miss this anyway, on the grand scale of excitement. More exciting are the cut scenes, which appear when you find a particular piece of evidence, just as in the TV show. Although they usually aren’t helpful in solving your case, they are nevertheless interesting. The bestselling author Max Allan Collins, who wrote the novels based on the series, is also the consultant for this game. Installation is problem free, and there’s a choice of minimal or full install. The CD does have to be in the drive to play the game. You have the option to play as beginner, intermediate or advanced, which is an improvement over the first CSI game which didn’t have that feature. Playing as a beginner will allow you to select active hotspots, evidence tagging, automatic questions for witnesses, and a tutorial. The tutorial isn’t separate, but consists of a disembodied voice talking in generalities during game play when you are trying to absorb the story line. The active hotspots are a wonderful feature. If you elect to play advanced without these active hotspots, you can spend a week one afternoon looking for evidence in the pixel hunt to end all pixel hunts. The automatically generated questions are nice as well, unless you prefer to drag the evidence icons one by one to the person you’re trying to talk to, in the hope that you can elicit some dialogue. Movement is point and click, and although you can sweep around in a circle, your forward motion is limited to areas where there is something of importance to the story. You click on items to get a closer view of them, and then select a tool to search for evidence, or a tool to pick it up correctly. For example, you might search using a magnifying scope, discover a stain, apply luminol to determine that the substance is blood, and then use a swab to collect it for processing at the lab. In addition, a piece of evidence may in closer view reveal an additional item of evidence, such as a fingerprint or a strand of hair that was not obvious on first glance. When you discover this “hidden” evidence, the game does a fast close up with sound effects at warp speed, which I thought was very entertaining indeed. Even after you discover this hidden evidence and remove it for processing, the game will continue to do the fast focus where it was, and you can continue to be amused as long as you wish. Essential to the stories are your visits to the laboratory and to the morgue when you have a deceased victim. In the laboratory you hand over your evidence, and most of the work is done for you by the technician. However, you are responsible for some activity, such as running the fingerprints through the computer program for a possible identification, or looking through the microscope to compare two hairs for similarity. Without fail, when I became stuck for a time in the game and couldn’t fathom what I hadn’t completed, it was because I hadn’t turned in a piece of evidence, or had not looked in the microscope or at the computer program to fulfill that element for a successful conclusion to the case. Once you have established sufficient evidence, you can obtain a warrant through the Captain for a suspect, or a search warrant for a location. This may lead to a successful conclusion to the episode, or may show a new twist to the case, and it is back to the drawing board. You also get to visit the Captain when you need an address. This struck me as fairly humorous – he must have some doubts about his investigators, since he won’t allow them to look up addresses by themselves. What a job! The tools and evidence you have collected are all available through a very user friendly interface. Tools are divided between those that can locate evidence, and those that can collect evidence. Evidence itself is divided to make it more manageable. 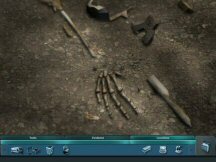 In addition, you have access to the cut scenes, and you have a tab sorted log that indicates how much evidence you have against a subject, or what progress you have made in identifying a body. After a case is concluded, you are given a few multiple choice bonus questions to answer. Correct answers will of course add to your point total. Your progress is saved automatically, and upon loading the game you will return to where you left off of the game when you played before. CSI: Dark Motives has better graphics than the first CSI game, but not as smooth as CSI: Miami, a natural progression I’m glad to see. The characters are recognizable as the people acting in the TV show, which will no doubt delight the CSI aficionados. But the graphics still remain only adequate in their grainy simplicity. The voiceovers of the characters were accomplished by the actual TV CSI cast. Again, this is a feature that will probably be a warm and fuzzy for fans of the series. Unfortunately, not all the cast carries the same enthusiasm for this project, and on occasion I suspect they had to be prodded awake to say their lines. Sound effects are unremarkable, and the music is – no surprise, the music from the CSI TV show. It isn’t annoying, or particularly memorable. Not surprising with a crime scene theme, there is content that may frighten children or disturb some adults. Dead bodies and gore abound, although nothing is gratuitous. Fans of the CSI series will no doubt be enthusiastic about the game, and grade it much higher than I did. If you aren’t a fan of the series, as I am not, it still provides a pleasant few hours as one of those “tweener” games – when you don’t wish to embark on a long adventure. Having the separate episodes makes it perfect for those days when you have little time to devote to a game. In the real world, crime scene investigators don’t interrogate, interview, or investigate outside of the crime scene and lab. Of course, this would make for a rather dull gaming experience, so poetic license is warranted here.